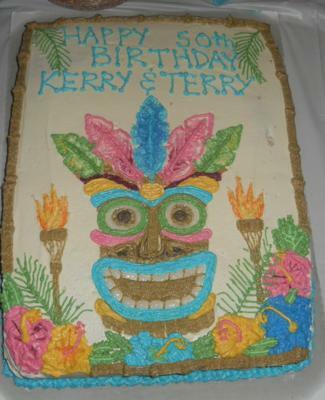 This 50th birthday tiki cake was inspired by a plate from a surprise luau party we threw for my Dad and his twin brother. I used the plate to refer to as I drew the outline onto the cake with a toothpick. Using various colors of homemade buttercream icing I colored in the Tiki and additional details. I used a toothpick to create more texture and blend the colors together. The cake was a hit and went well with the themed party. That is too cute! You did a great job!